Learn more about studying law and criminology at these informative workshops on criminal law, globalisation and policing. La Trobe Law School offers practical, innovative and accessible programs that equip students to graduate ready to practise law in Australia. 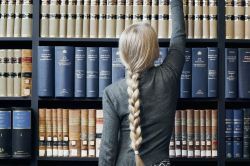 Studying the Bachelor of Laws you’ll develop essential legal skills such as advocacy, mediation, negotiation, critical thinking and dispute resolution. Learn the versatility and skills that make you more employable. Prepare for the future of law by exploring emerging areas such as law and technology and legal entrepreneurship. You’ll also benefit from over 150 clinical placement opportunities, industry networking events and classes with practising scholars. La Trobe’s Bachelor of Criminology combines a high-quality criminology education with a commitment to social justice and an emphasis on practical experience. Our Bachelor of Criminology helps you understand the complex causes of crime and develop innovative responses to it. Globalisation and Policing: Perspectives from Australia: The world has become increasingly interconnected in an economic, social and political sense. This has significant implications for traditional conceptions of policing. What are some of the most important manifestations of this process in the Australian context? How can we best achieve a critical understanding of the transformations taking place? In this workshop, we will identify and discuss different examples of how policing is influenced by global transformations, and thus discover some of the most important (and exciting) aspects of policing studies in the ‘globalised era’. Should that be a crime? What is a crime? What things should be made a crime? What should not be a crime? How do we make something a crime? How should we punish people who commit crimes? Dr Steven Tudor, lecturer in criminal law in the La Trobe Law School, will lead an interactive discussion on these fundamental questions about the nature and purposes of the criminal law.